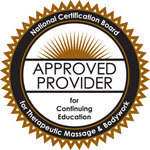 Full Circle is approved by the National Certification Board for Therapeutic Massage and Bodywork (NCBTMB) as a continuing education approved provider. Additionally, each course offered by Full Circle is accepted for state continuing education, where appropriate. These two processes ensure that Full Circle’s continuing education courses are rigorously vetted for quality standards. Alaska does not require continuing education hours at this time but you can still experience the benefits of adding Spontaneous Muscle Release Technique to your practice without having to purchase CE credits by taking advantage of our DVDs or Downloadable Webinars. Approvals and CE’s Please check back at a later date for more information on Requirements.